What exactly is in there? Look at the fat in that!!!! And is that egg...? It looks more like mash potato! 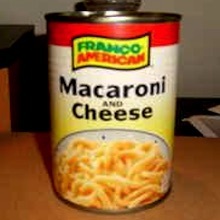 Is mac 'n cheese in a can normal? It's difficult to describe. The macaroni is really long tubes, like bigger than your thumb. And it was quite the treat straight from the can. Hard to explain, but yummy as heck. Or hella' yummy as the kids say. I think I heard a kid say that. Or something. IIRC, it had a sort of grainy texture unless it was heated high enough. I think you had to get the plastic at the right temp to be gooey & saucy. this intrigues me.Good with chopped up fried hot dogs mixed in?oh yeah. This stuff has a cult following. It's one of the best canned foods ever. You'd have to except beans and tuna of course. And I suppose Spam. Hadn't thought of that. Fried (just assume everything is fried ) diced spam or hot dogs, spaghetti fried in either butter or bacon grease, and scrambled eggs, served with your favorite sour dough (or other). I must hunt down a can...I can order one likely? Ever have beans AND weenies in a can? Have not seen that in over thirty years. I miss Saturday morning cartoons.I'd get up. No, this was discontinued at least a decade ago. Never had canned beans and weenies. Closest I recall was Spaghetti'O's, but that was pasta. Seems like the bean & hot dog thing would be a natural, though. Can't do the scarios ect...chef boy ardee once in a blue moon. Haven't had these in years. Kind of tempted now to buy a can of Ravioli though. Ugh. Now I remembered these. 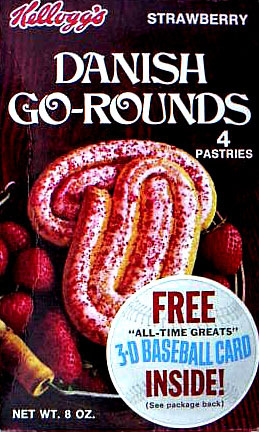 They put PopTarts to shame. Kraft dinner, there is no other mac and cheese.